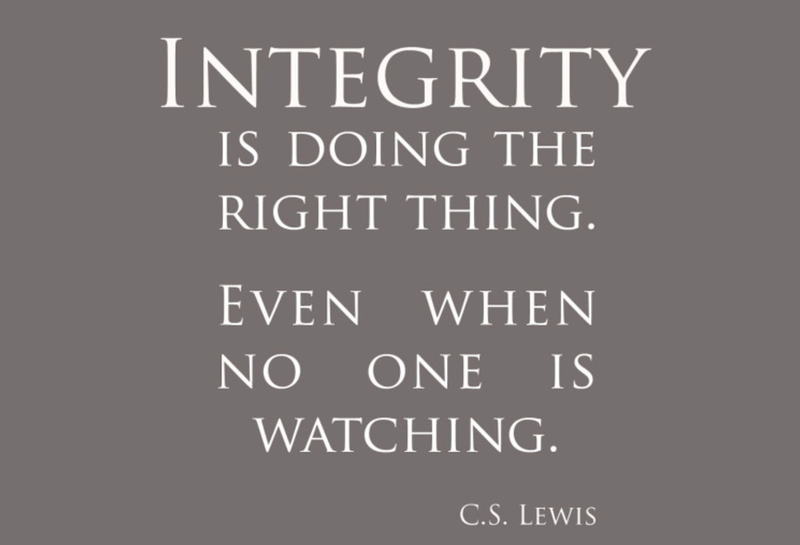 Integrity (noun): adherence to moral and ethical principles; soundness of moral character; honesty. In this posting, the focus will be on integrity. Why is integrity important in business? Why does it matter for a person in business to have integrity? Getting the right people into positions in a business is critical to success. Because people are a key component of how a business operates, the inner-workings of it’s personnel are important. As soon as you bring on a new team member to a project, there is a relationship that forms and trust is one of the foundations for any relationship. A person with integrity can be counted on to be honest and operate in an ethical manner. He or she will gain the trust of the team and the customers (both internal and external). Naturally everyone doesn’t need to be best friends but it is important to have mutual respect and trust. Having employees with high integrity will foster a culture of collaboration because you can depend on this person and it is much easier to work with someone you can trust. A person with integrity does not need laws, rules, and regulations in order to do what is right. When you have integrity, you are someone who can be honest, upright, and fair in your business dealings. You do everything in your power to achieve company, project and team goals regardless of the role description. For this reason, the agile manifesto (http://agilemanifesto.org/) explicitly states that it values “customer collaboration over contract negotiation”. And because people are not perfect, a person with integrity will take accountability for problems on a project. Dealing with problems in a timely fashion and without emotion allows course corrections to happen much faster than churning in a blame game. In an introductory interview, integrity can be very difficult to assess. Questions to assess integrity can be asked about how candidates have dealt with difficult people, stressful situations, or ethical dilemmas. You may need to dig for details of how the candidate had to take the high road in a specific situation even if that meant pain in the short term. It will be worth the time to explore this facet of a candidate because you will not want to bring in a “bad apple” into the bunch. Overall I rate integrity highest on my list because I want to have a good relationship with my team, I want to trust in them and want them to trust in me, and I want to have team players focused on success. If you’d like to talk more about how ImagineX differentiates itself by our people and how we can bring amazing talent to your organization, then please contact us today.